That such a series of betrayals could be orchestrated by one man so lacking in remorse that his final words of explanation are merely that he will give no explanation speaks to how calculated Shakespeare’s choice is to leave the audience without closure. 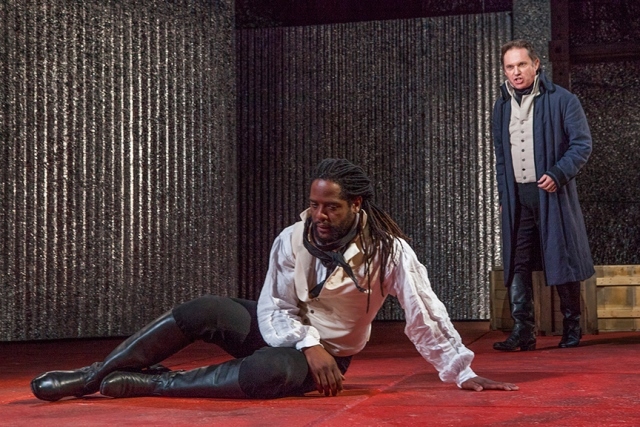 An unrepentant Iago (Richard Thomas) denies a devastated Othello (Blair Underwood) the one thing he desperately seeks to know – why – by saying, “Demand me nothing. What you know, you know. From this time forth I never will speak word.” And when Thomas delivers those final words calmly, coolly, without even looking at him, it is enough to give you chills. 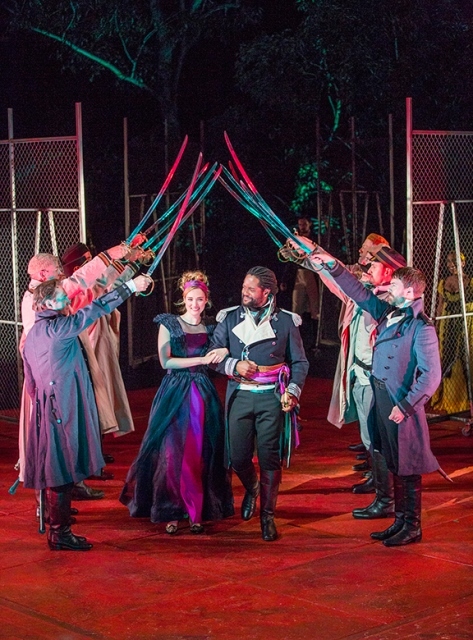 Powerfully directed by Old Globe artistic director Barry Edelstein in his outdoor debut at the Globe’s Summer Shakespeare Festival, the play moves forward with carefully measured intensity. Both Thomas and Underwood are skillful with the text, each using the language to affect others in his own way and with his own specific rhythm. For Thomas, it is by biting into the words and using the consonants and vowels to accommodate the abrupt changes he makes in his strategy as new challenges arise. He displays an explosive range of emotions in his role of puppet master, secretly working each pawn to his advantage while sharing with the audience the full measure of his evil in private speeches. He is as slippery as an eel and as deadly as a viper. 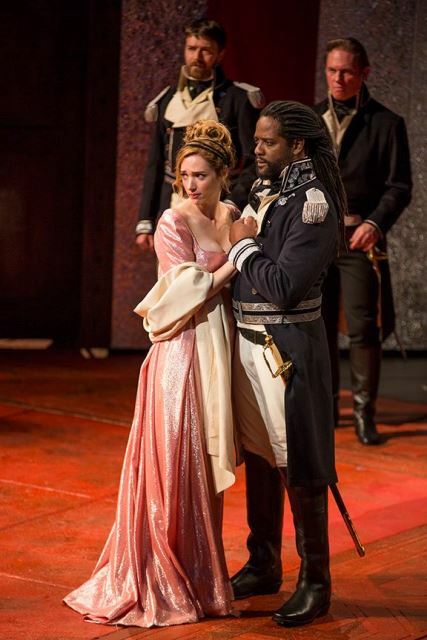 Underwood is wonderfully poised as the dark Moor, even seductively so, with a hypnotic quality to his deep, rich voice that instantly shows how an outsider such as him could have wooed the fair Desdemona (Kristen Connelly) and won her regardless of their vast differences. You have only to hear him say her name, drawing out the vowels in his island-tinged accent, to understand the deep love that he feels. In that one word – Desdemona – we hear all of their relationship. It becomes a kiss, a caress, a moan, or even a cry. Shakespeare’s poetry floats as Underwood colors words and phrases with exceptional grace. As the cherished wife, Connelly offers a Desdemona who happily isn’t a weak flower. She is as strong and centered as convention will allow within a patriarchal world that puts little stock in the strength of a woman. It is only in the speeches of her companion Emilia (an excellent Angela Reed) that we get the full picture of the trials a woman must bear in service to her husband. The supporting cast is also quite strong. Noah Bean stands out as the handsome Michael Cassio who causes himself a world of difficulty because he cannot hold his liquor, as does Mike Sears as Desdemona’s father Brabantio and Mark Pinter as the Duke of Venice. Curtis Moore’s original music permeates the play with a sense of foreboding from the very beginning with percussive figures and the sound of marimbas, drums, and other exotic instruments that musical director Ryan Nestor and Jonathan Hepfer play in full view from an upper platform. Moore accentuates one of Iago’s most effective acts of deceit with a rousing drinking song to which Thomas has added precisely choreographed movements and vocals to accomplish his devious plot. Combined, the effect is both disgusting and funny providing a much-needed moment of release before the tension begins to build again. Wilson Chin’s set design, consisting of silvery walls and fluid spaces that open up like a movable picture frame without the glossy paper, transforms under Stephen Strawbridge’s striking lighting effects leaving indelible images behind: a curl of smoke from Iago’s cigarette as he peers off into the distance; a fetal Othello, crumpled in an epileptic fit on the floor while Iago stands over him with a smirk; a bed wheeled onto an empty stage in the golden glow of deathly silence. And as the green-eyed monster slowly eats away Othello’s reason, Iago moves closer to his victory. Like a virus that burns the mind and cracks the heart, so does this sad tale remind us of the frailty of our own human nature. Beautifully written. Would love to see this one.